Update 4/3: Someone was nice enough to post this on Hacker News, so there’s some further discussion at https://news.ycombinator.com/item?id=9314185 for those interested. As a bonus, check out the last section of this post for important info on Chrome’s confusing, non-intuitive behavior when you use the console to inspect an object or array. console.assert() takes two arguments: a condition to be evaluated, and a string to display if that condition is false. If the condition is true, nothing is displayed. The condition argument will generally be a variable you want to inspect at runtime, or a function which will be evaluated based on its return value. In either case, the final value is type-converted to boolean. Logging assertions to the console is an easy way to test a small piece of code ‘on a budget,’ without the overhead of a test suite. The assertion also captures and displays the call stack at the time of any failure. console.count() is a method that logs the number of times it has been invoked as the program runs. It takes a message string as an argument; each time the .count() line is invoked, the message is displayed in the console, along with the running count. The big issue with this one is that it prints to the console on every invocation. You’ll want to use it to count something occasional rather than, say, the number of times a recursive function is called. console.dir() has some unexpected behavior that you should definitely be aware of. Make sure you read the ‘caveats’ section at the end of this post for details! None of this is new, but what may not be obvious (and wasn’t, to me) is that each of the messaging methods has a couple helpful ways of formatting your output. The following examples use console.log(), but all of the methods in this group act in the same way. Option 1) Pass strings or variables as individual arguments to a messaging method to avoid the effort of manual string concatenation. Doing this will also net you a more complete (or at least syntax-highlighted) representation of objects, arrays, numbers and regular expressions. // The value of num is 5! Option 2) Use string substitution and formatting to easily create complicated messages. Here, %d and %O are ‘format specifiers’ representing references to a number and an object stored in someVal and someObj, respectively. I won’t go into depth on the different specifiers, but a quick tip is to always use %O for objects, arrays, functions and regular expressions to get a complete picture of what’s hidden inside them. If you’re interested, Google’s excellent resource on the topic lists all the format specifiers you can use. Just like with console.dir(), log formatting has some unexpected behavior that you need to be aware of. More details at the end of this post. The console’s grouping methods help keep all the stuff you’re writing to the console organized. group() and groupEnd() mark the start and end points for a collapsible ‘tree’ of log messages. Any messages that are logged between group() and groupEnd() will show up in the same branch of the tree. groupCollapsed() works the same way as group(), but its branch is initially collapsed, while group()’s is initially open. group() optionally takes a label argument for your reference, and nested groups are possible. Just be aware that groupEnd() does not take a label–it simply closes the most-recently opened group. Tables are a flashy way to view and filter a subset of the data stored in arrays or objects. console.table() takes as its first argument an array containing the data (subarrays or objects) to be examined. Optionally, you can provide an array of key names as the second argument to display only those keys from each passed-in object. 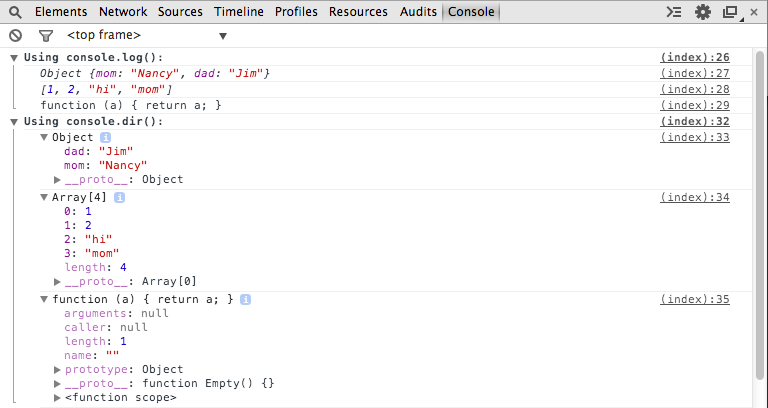 console.trace() prints a stack trace from the time when it’s called. As usual, you get links to each respective line of source code to examine. If you want, you can pass a string to trace() to display a label. The label argument is technically optional here, but it’s best to provide one to avoid conflicts between multiple running profiles. Without labels, the general rule is that calling profileEnd() while more than one anonymous profile is running causes the most recent profile to end first. Finished profiles are added to the profiles tab of dev tools. Sometimes you don’t want to engage the whole profiler to get a benchmark of your code. In those cases, it’s faster to use time() and timeEnd(). Call time(‘label’) immediately before the code you want to benchmark, and call timeEnd(‘label’) immediately after. TimeEnd() logs the elapsed time to the console. Remember that the label on this one is not optional: you must call time() and timeEnd() with the same label or it won’t work. You’ve noticed that dir(), and log() (under some circumstances) will represent a value in the console in a drop-down ‘tree’ structure, like in the image shown in the dir() section of this post. When displayed in this format, the value’s representation will change if the value it references is modified. The console representation of a value, when displayed in the dropdown format, is not a snapshot of the value’s data at the time it was logged. In fact, it remains live until you come along and expand the tree. At that point, anything inside is frozen from there onward. Here I console.dir() an object to to the screen, then before expanding the tree I change one of the object’s properties. Expanding the tree reflects val1’s new value, not the one it had when it was logged. In this example, I use console.log() to show an object with many properties, then change one of the object’s properties before expanding the tree. Notice how val2 has a value of 2 on the first line, and a value of 14 on the third. When in doubt, you should use a method that prints a string representation to avoid this problem. Try using JSON.stringify() for long objects or arrays to prevent a dropdown from forming.